London Mums have 50 cookery books kindly donated by Sacla’ called ‘La famiglia – the family book of pesto’ to give away. Sacla’ have teamed up with chef and mum Rachel Allen to create some new Pesto recipes, especially for those important family moments around the table. For your chance to win one of these cookery books, write the name of your favourite Italian family meal idea in the competition form below this post. Deadline to enter is midnight on 15th September 2018. Try and make some of Rachel’s recipes that are published in the London Mums’ food section and visit sacla.co.uk/kids for more family recipe inspiration. 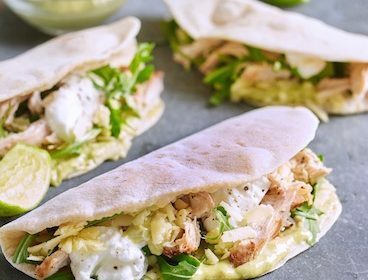 This recipe for PIADINA was kindly donated by Sacla’ who have teamed up with chef and mum Rachel Allen to create some new Pesto recipes, especially for those important family moments around the table. Try Rachel’s recipe for PIADINA which is included in the new Sacla’ cook book ‘La famiglia – the family book of pesto’. Rachel said about this recipe: ‘This is a play on the classic piadina that hails from the Romagna region of Italy. Children love them and they can create their own toppings and ‘build’ them with you – an alternative to Mexican fajitas for any time in the week.’ Try and make it following Rachel’s instructions and visit sacla.co.uk/kids for more family recipe inspiration. 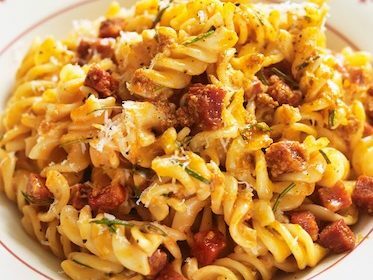 This recipe for FUSILLI WITH TOMATO PESTO, CHORIZO AND ROSEMARY was kindly donated by Sacla’ who have teamed up with chef and mum Rachel Allen to create some new Pesto recipes, especially for those important family moments around the table. 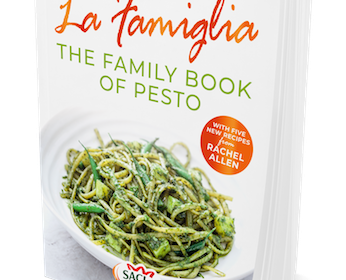 Try Rachel’s recipe for FUSILLI WITH TOMATO PESTO, CHORIZO AND ROSEMARY which is included in the new Sacla’ cook book ‘La famiglia – the family book of pesto’. Rachel said about this recipe: ‘I’ve always got chorizo in my fridge and pasta and Pesto in my larder. So this dish is so familiar, I can cook it with my eyes closed.’ Try and make it following Rachel’s instructions and visit sacla.co.uk/kids for more family recipe inspiration. 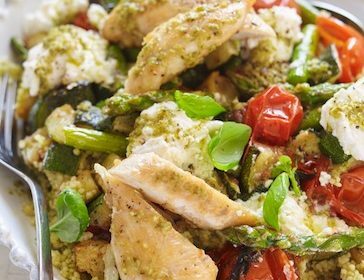 This recipe for Chicken with Pesto Roasted Vegetable Couscous was kindly donated by Sacla’ who have teamed up with chef and mum Rachel Allen to create some new Pesto recipes, especially for those important family moments around the table. Try this recipe which is included in the new Sacla’ cook book ‘La famiglia – the family book of pesto’. Rachel said about this recipe: ‘Couscous is quick to prepare and fool proof. It offers endless possibilities so you can have great fun, creating your own masterpiece, using different combinations of vegetables and protein.’ Try and make this Chicken with Pesto Roasted Vegetable Couscous following Rachel’s instructions and visit sacla.co.uk/kids for more family recipe inspiration. 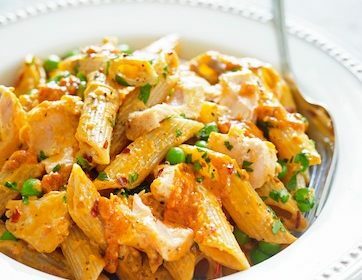 This recipe for PENNE WITH SALMON, PEAS AND CHILLI PESTO was kindly donated by Sacla’ who have teamed up with chef and mum Rachel Allen to create some new Pesto recipes, especially for those important family moments around the table. Try Rachel’s recipe for PENNE WITH SALMON, PEAS AND CHILLI PESTO which is included in the new Sacla’ cook book ‘La famiglia – the family book of pesto’. 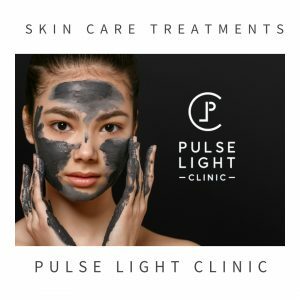 Rachel said about this PENNE WITH SALMON recipe: ‘My family all love chilli and so this recipe, using Sacla’ Fiery Chilli Pesto, is a real crowd pleaser. I like to use wholewheat pasta for that extra bit of nourishment and some chilli flakes for an extra bit of heat.’ Try and make it following Rachel’s instructions and visit sacla.co.uk/kids for more family recipe inspiration.